I am leaving tomorrow for Marc Adams School and my week of box making, so I have been gathering necessary supplies, and jigs and demonstration boxes and loading the Subaru. I will be able to post some photos during the week and will try to do so here and at my boxmaking101 blog so you can keep up with progress. My tables will be waiting here in my Arkansas wood shop to be finished when I return. I was able to review my Rustic Furniture Basics DVD this morning. It went into production today. You cannot order the DVD yet, but the orders for the book Rustic Furniture Basics can be placed at Amazon for delivery in late September or early October. 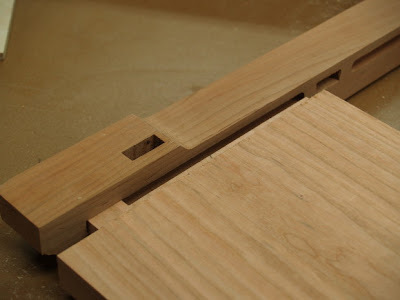 The photos above and below show two sides of the same set of joints used to secure the parts of a "torii table". The table itself is an exercise in the use of mortise and tenon joints. I still have one more round of sanding to do, and will pay particular attention to all the routed edges. By looking closely at the photos you may notice the way edges where parts intersect are shaped in relation to each other. Attention to details is the means through which the maker expresses his vision and his character. As I mentioned earlier, these tables are an opportunity to revisit one of my earlier designs. 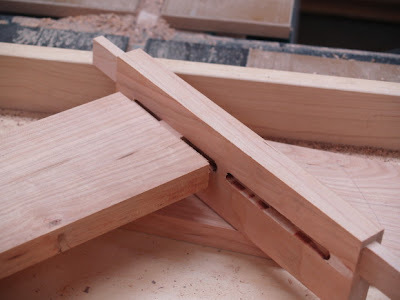 At the time, I had this sense that by exploring woodworking joints, I had my best potential for growth as a craftsman, and that joints themselves were far too interesting to be hidden from view. John Deal sent a link to a blog posting on the "ultimate irony of college education." It seems that many of the maintenance people who have kept our college campuses so beautiful are retiring and colleges are having great difficulty finding skilled workers to take their place. The even more ultimate irony (if there could be such a thing) is Yale. They have a hand carved stone campus but are not teaching any of their students to carve stone. You and I know that the early educators were right about the ways that the use of the hands builds character and understanding, and that students will not have a sense of the dignity and value of labor without their own hands having been engaged in skilled creative processes. It would be nice if college administrators would state a collective "oops." 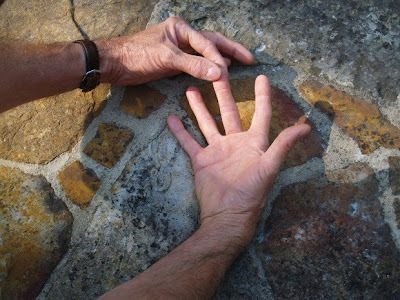 If students and faculty have no knowledge of what it takes to carve stone, neither will they have a clear sense of the value and beauty of that which surrounds them. You can say, that they are "out of touch." The blog posting can be found here. In the meantime, on a more hands-on subject, Sam Maloof is featured on the cover of Fine Woodworking this month. It is a very rare circumstance for Fine Woodworking to make such a deliberate tribute to a craftsman. 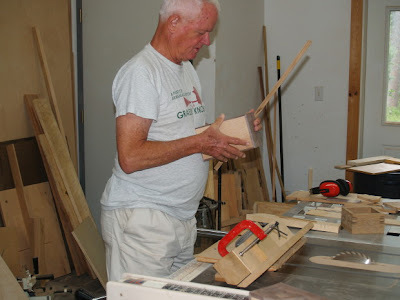 Ironically, this morning, I was showing the Clear Spring School wood shop to a prospective ESSA teacher, Les Casteel, who had taken classes with Sam Maloof and spent a week learning from him in his studio. Les told of Sam's love of chalk. He said that chalk can be used, not only to draw on wood, but also to lubricate screws and to highlight areas needing additional sanding. 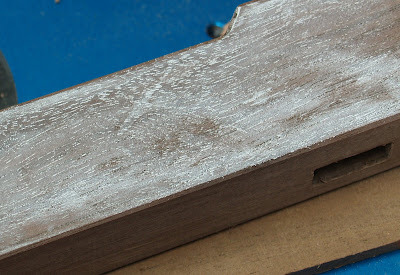 In the photo above, you can see the use of chalk on wood. Lines going across the grain and highlighted by chalk are saw marks still needing to be sanded away. 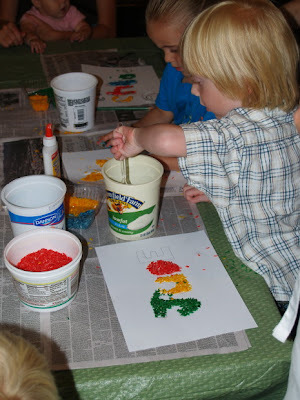 The chalk is a great teaching tool to help beginners see what the trained eye will have already noticed. On another subject FedEx delivered a review copy of my new DVD which I will watch later in the day. It is scheduled for release in late September or early October. You can see that I continue to make progress on my tables. 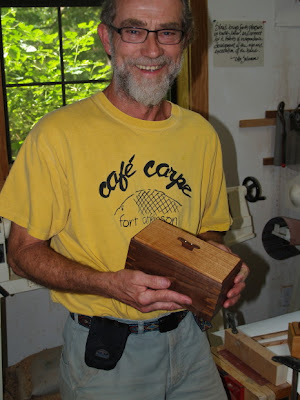 I leave for teaching Box Making at Marc Adams School of Woodworking on Saturday and will have 18 students next week. I won't get these tables done before I leave. It will be nice to have work waiting for me on my return. In the photo above, I am routing the end stretchers. 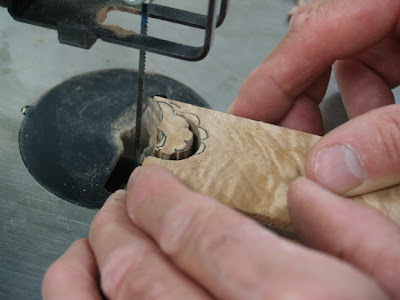 Below, you can see the small details that make each piece of wood clearly defined. As they say, the devil is in the details. Often the beauty can be found there as well. 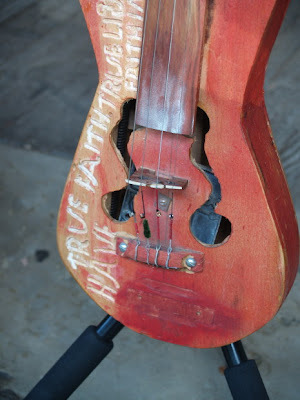 I've been thinking of the word authenticity as a result of seeing Ed Stilley's guitar and fiddle. They are authentic, original, unusual and the creation of a single man's unique vision and intent. If you are comparing them with a Yamaha, or Taylor, or one of the fine hand-crafted guitars in the luthier's tradition, they might not measure up to some set of preconceived standards. But so what? When I was at the furniture design opening at the Historic Arkansas Museum, I met a fellow woodworker whom I have admired for many years but had not previously had a chance to meet. As he described his deep interest in getting computerized tools to do his craftsmanship, cutting costs, but also increasing visual interest, I mentioned, "I think we are moving in exactly opposite directions." My comment was not intended as an insult. For some, getting computers to take over more of the craftsmanship involved in their work work might be authentic. It was in his perspective, but not in mine. As we talked, we were standing by the bench I made for Crystal Bridges Museum and there were signs all over the museum stating "do not touch." His hands were all over my work caressing it and ignoring the warnings. Who could blame him. Wood is irresistible. And I was honored that another woodworker with such a completely different objective would find what I presented as being of such interest. Today (as yesterday and the day before) I am sanding away all the milling marks on the mountain of parts that will become 6 tables in walnut and cherry. The object is that the beauty of the grain and color will be revealed without distraction. As a reflection of my interest in authenticity, each piece is cut from solid wood. In this design I find it important that wide pieces are not glued up from narrow stock, but reflect the authenticity of the materials used. This severely limits my selection from available materials, but also makes even more certain that each table is unique. 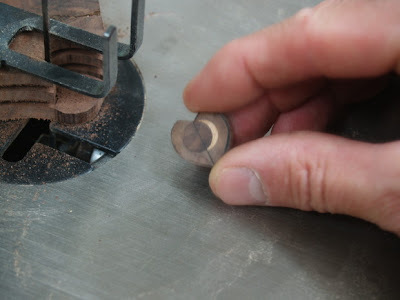 The parts as shown above go through 4 sanding operations. 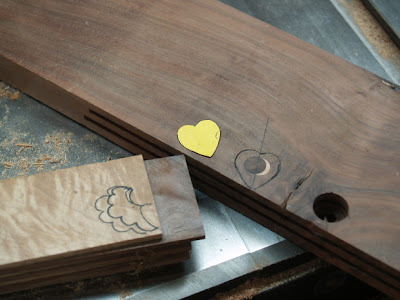 Edges will be routed, then slots will be cut in the tenons for contrasting wedges to fit. 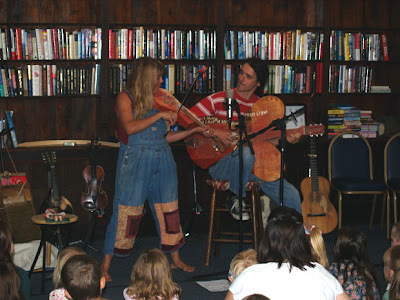 Today I went to a live concert for children at the Carnegie Public Library featuring Donna and Kelly of Still on the Hill. They brought Ed Stilley instruments and played them on one song, so I got a chance to take some photos. I know music is a big part of most children's lives and it is a shame more of it isn't live. 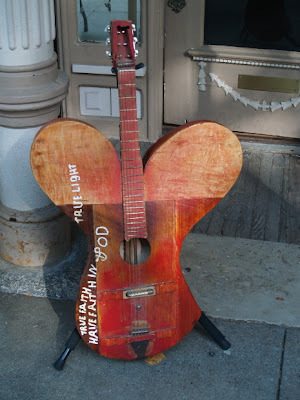 As you can see from Ed Stilley's instruments, they can be made from what you've got. These are authentic, based on knowledge that comes from experiment and personal investigation. 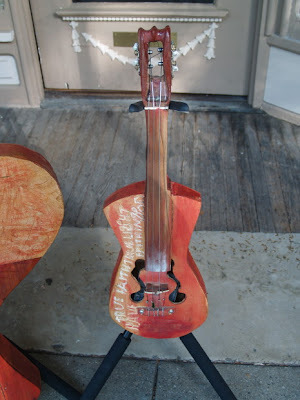 The images at left are of one of Ed's "butterfly guitars" and a hand crafted fiddle. They don't sound like a Taylor or a Stradivarius but they play. Each of Ed's instruments is engraved with inspiration from the Bible. If you think of Ed's guitars in light of yesterday's blog post concerning the two types of knowledge, wissenschaft and kenntnis, you can see that Ed's guitar making knowledge is kenntnis, from direct experience, having little to do with the close examination of other guitars, instruction from others or book learning. His only book of interest is the Bible. If he were looking for perfection in the guitar making art, he might find wissenschaft book learning or 2nd hand instruction of some value. But his guitars and fiddles can only be fully understood in light of his intent... to put music in the hands of children. He has made and given away over 100 guitars to children. Ed's instruments fit in quite well with the theme of today's concert... "What if you lived here in the Ozarks 200 years ago and the only music you heard was that you could make for yourself?" And as Donna points out, the writing on the guitar does not say "iPod". A slideshow of Ed's music, and images of his guitars and work can be found on the Still On the Hill website. Thanks Bob, for the link. 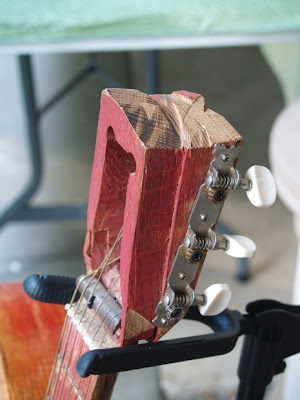 The photos show some of Ed's interesting method for increasing the sound of his guitars and fiddles, springs and saw blades. 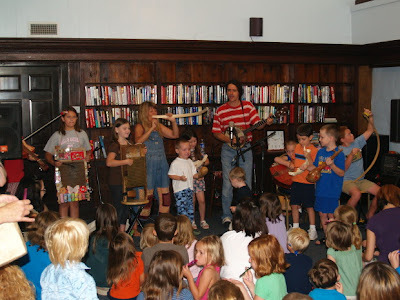 The concert was a rousing success and led to children joining Donna and Kelly onstage for an Ozark orchestra of hand made instruments. My sincere thanks to Donna and Kelly for their rousing and wonderful performance and for giving me a chance to take closeup images of Ed Stilley's art. Our current model of education in the US, however is to impart wissenschaft, without kenntnis. This is in large part I suspect due to the current emphasis on testing. We can offer information, (second hand, of course) and then test to see that the student can repeat or remember what we have offered. So it makes education cheap. We don’t have to provide any sort of real experience at all. But in failing to provide experience, we cheapen the experience so that it actually has little value to those students, particularly boys, who are left wondering at that back of the class, "What the f___ am I doing here?" Testing for knowledge gained from real experience is a much larger challenge. How can we test for real skills? It requires people with real experience to do so, and kenntnis is much harder to measure. In a society of anxiety, overly concerned with measurable success, those things that are easiest to measure become the predominant concerns. Now one of the only skills that parents and children and teachers are most concerned about is the skill of taking tests. They have found that like other human processes, practice is required to gain the best results, and the test scores have become more important than the knowledge gained, as the scores themselves and not the learning they represent are important for opening doors to college. What is the proper balance between kenntnis and wissenschaft? Experiential knowledge and second hand shared knowledge? 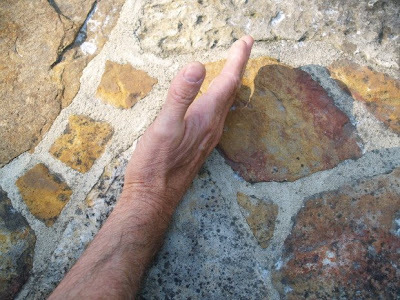 Remember in the writings of Otto Salomon and other early educators, the relationship between the concrete and the abstract? As stated by Salomon, education should move from the concrete to the abstract. Pestalozzi, Froebel, and others including Salomon believed that we should start in learning with the concrete allowing investigation. For Froebel, that was accomplished through the introduction of "gifts," objects whose qualities were to be investigated in the classroom. For Salomon, Froebel's investigations of form and material were to be continued at the upper levels through the use of woodworking as a tool in general education providing direct hands on experience of tools and materials, the essence of kenntnis. Wissenschaft is knowledge shared but also offered up for comparison and criticism. We evaluate what we are told in comparison to the experiential knowledge gained from our own investigations. If we look at the international scientific community, and all the benefits of modern technology, we see the benefits of that balance. But when education lacks the fundamental concrete investigation that provides a framework for the evaluation of abstract or second hand knowledge, society is placed in peril, at risk to manipulation by demagogues. Lacking kenntnis, these days we pick and choose what to believe based on conformity to the manipulations and machinations of others rather than on comparison to a foundation of self-discovered truth and confidence of our own investigation. Sounds like the perfect formula for delusion. And if you are following internet media these days, you will see plenty of examples. It may be a long death, slow and painful to some, but Time Magazine has an article this week virtually announcing the death of cursive. The article, entitled "I'm 26 years old and I cant write in cursive" by Claire Suddath seems to be OK with things. What good is cursive writing anyway? While digital input devices have stepped in to replace the pen and pencil for most communication, the article suggests that our fixation on educational testing is responsible for the demise of cursive. "If something isn't tested, it is viewed as a luxury"... in other words, schools don't care how a child holds her pencil as long as she can read. What if in the loops and curls, the flow of words from the mind to paper, there are things that happen in the poetry of thought? Friedrich Nietzsche suspected there was... That the tool used in the expression of thought affected the qualities inherent in that thought. We may never know. After all, the poems that are not written will never be missed... or will they? For some, however,at least for those still gifted or practiced in doing so, being able to write clearly, or even beautifully is a matter of pride. It is an expression that one cares about self and how self is expressed. Personally, I wish I could write more clearly, more legibly myself. Like any kind of craftsmanship, it requires practice, and through lack of practice we are rapidly losing many important forms of personal expression. We might as well, I fear, take our virtual places as disembodied game pieces, avatars on small screens. We can fly seamlessly through space, over wires and wireless routes until someone pulls the plug and we come crashing back to physical reality. I have been reading an advance copy of David Mas Masumoto's new book Wisdom of the Last Farmer. As an advance copy, the publisher asked me not to publish reviews of it until the publication date of August 4. I've been thinking lately of the ways that physical location affects us. In a sense, the earth rises up through us much like the nutrients pass from the roots to the leaves and branches of a tree. Few Americans any longer have a sense of place. We have little sense of belonging to the earth or even to each other. Masumoto's book is a firm reminder of what we have let slip from our grasp. 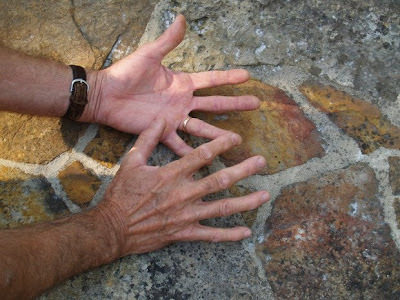 And it is also a worthy tribute to the hands: fixing, making, growing and caring for each other. I have also been reading Matthew Crawford's book Shop Class as Soulcraft. Being on the wheels of a motorcycle, is another realm entirely, and yet within the craftsman's reach, there is power to transform. Most of us in our current culture have been uprooted. But it is through taking charge of the the things within our reach that we ourselves are created anew. A third book on my reading table is Boys Adrift by Leonard Sax, MD. He states clearly and firmly what you have already known, and that all the early educational theorists from Comenius to Dewey expressed as well, "Kids need to experience the real world." So the question arises, what can we change? How can we put at least some small element of the real world into schools for the purpose of making school real? The wood shop. Every child should have the opportunity to make things that are real, lasting confirm their value and restore meaning. Today I am sanding the parts of my tables to prepare for assembly. Some of the work will be done with power sanders, but the fine details can only be done effectively by hand. 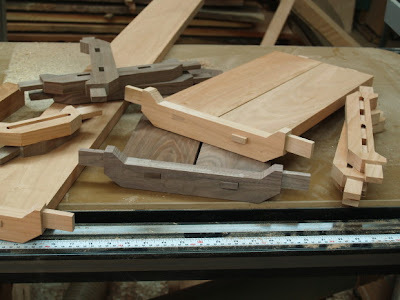 In the photos above you can see the lower stretchers shaped and ready for the shelf to fit, and the use of a sanding stick to begin sanding the small parts. I used spray adhesive to attach sand paper to the stick, making an effective tool for the job. Power sanding these parts would distort their shape. 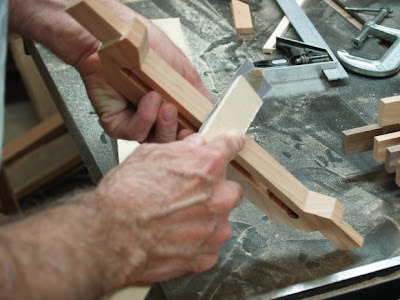 They have shown the patience to hand cut their mortise and tenon joints and make some very accurate dovetails. Given the opportunity to show their skills they have not let me down. So far they have met every challenge that I have given them, without complaint. To do this sort of work you need a calm atmosphere and a group of students that you can trust. They have shown a high level of maturity and ability to get on well with each other. I feel very lucky as a teacher to be able to walk out of the class room at the end of the day and feel a calmness that is real. The decision to do things by hand pays a real dividend. I have also found this with junior classes who seem to develop a more caring approach to their work when shown how to do things with their hands. I can only hope that this will extend into the rest of their lives. The values we teach by doing things by hand are immeasurable. You will probably suspect that these proud students are equally grateful to have Richard as their teacher, and to have had the opportunity to do work that will last a lifetime and that they will always remember. My article "Sloyd, Wood Shop and Formative Education" for Furniture Matters, the newsletter of the Furniture Society arrived in the mail today. It is nicely edited and to the point that concerns us all, getting the hands back involved in the education of our children. This year, the subject of the annual Furniture Society Conference is right up my alley: Fusions: Minds & Hands Shaping Our Future. It will be held at MIT and I'm planning to attend. Today I am doing the last fitting of parts. 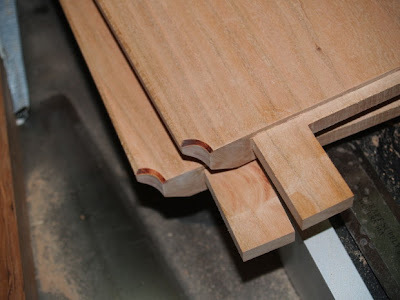 I cut the mortises in the end stretcher that allow for the bottom shelves to be fitted, then use the the router table to cut grooves that prevent the shelves from twisting as they inevitably expand and contract in place. This is different from making a table from particle board. The joints are real. No pretense, not excuses, and while they are not hand cut as they would have been anytime between the dawn of man and the 18th century, they are real; they are functional and the making of each joint requires human attention. 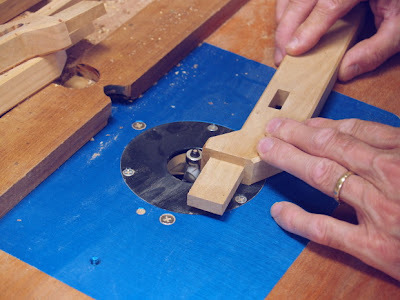 The stop blocks on the router table control the movement of the stock, providing stopping and starting points for the operation, making the groove blind, meaning that it can't be seen in the finished joint. So there are a few secrets a craftsman does keep to him or her self. the stop blocks will be repositioned for routing the matching grooves to house the other shelf. You can see the resulting fit in the photo below. John Deal spent the weekend learning contemporary boat building techniques at the North Carolina Maritime Museum and sent the photo of a boat currently under construction. 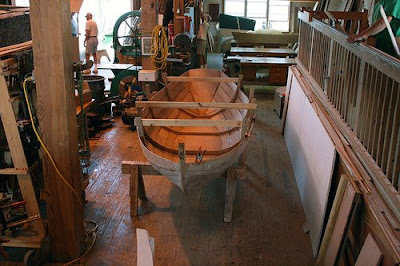 Who can resist the beauty of a boat under construction, or the fascinating shop in which it is being made? John passed along a regional saying, "By the rack of the eye." Which means to be guided solely by the eye without line or rule. --judgement by eye of accuracy, alignment, length, etc. (rather than by the use of a ruler or other instrument). Norse in origin, Usually heard only in the dialect expression "..bi t'rack o' t'ee" ("..by the rack of the eye"). cf Swedish rak (straight) and Norwegian rak (direct, straight, erect). How the heck the Vikings got to North Carolina, we will never know, (maybe by boat?) but it might explain the local interest in stitch and seam. I am now working on the last of the many mortise and tenon joints used in making small walnut and cherry tables and you can begin to see the complexity of the process. As you know, tables can be made much more simply than this, but unlike my rustic tables, simplicity of construction is not the object in this case. And yet, the message I hope to convey is a rather simple concept. As you may have noticed nearly everything is concealed from us. As Matthew Crawford points out his book Shop Class as Soulcraft, even Mercedes Benz cars, no longer have dipsticks, as consumers are no longer able to deal with complexity. They want to sit behind the wheel, all personal delusions intact. The thought of something that is oily and greasy, and that might touch clothing would be extremely offensive and might drive them to choose another model or something. All the moving parts are hidden from view, as the consumers are no longer to be trusted with any level of understanding or interest in moving parts. It is part of the process of disembodiment that goes with having attained the delusion of status and prestige. I want the viewers of these tables to look and see and understand: These things, these tenons, these mortises, these interlocking male and female parts that connect discrete pieces of wood and join them into an integrated, purposeful whole. If I can get my viewers interested, they might find themselves actually touching something. John Deal writes that he took a boat making class last weekend, that the teacher had been a shop teacher at one time, and the class discussed the loss of industrial arts training in schools. Years ago, if you needed to make a cut with a table saw, there was likely a school in the neighborhood where such a thing could be accomplished. Now schools with shops, and even worse, schools with shop teachers are things of the past. It doesn't surprise me. 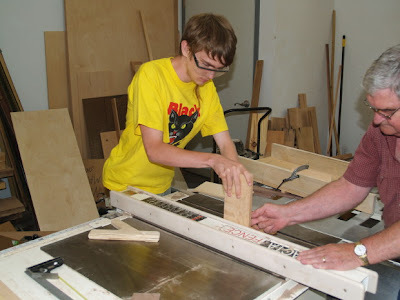 The role and value of the wood shop to all students was marginalized long ago. I have a number of friends who were industrial arts teachers at one time or another, so it doesn't surprise me that school shops have gone away. You take a teacher. Give him or her large classes filled with sharp objects, the students being the ones "incapable of sitting still" or "behaving" in their other classes. The administration hopes that the teacher will through his force of discipline and control rescue these kids from the brink by providing something that will at least keep them in school long enough to graduate. In addition to all that, he or she has materials to prep, and machinery and small hand tools to be kept in perfect working order. It is an awesome responsibility and monumental task. Wouldn't anyone rather grade papers and present boring lectures for the same or even larger salary? The whole problem is rooted in our society's failure to understand the relationship between hand and mind. Use your hands, you get smart. Still your hands, you get educated. Use your hands and get educated and you may change the world. And there's the rub. A grave danger to the status quo. I watched CNN's Black in America 2 last night which showed children from poverty in Brooklyn traveling to Sowetto, South Africa to learn from and affect the lives of black children on another continent. It was a profoundly moving presentation, and I would encourage all my readers to watch it. The discoveries of science, the works of art are explorations — more, are explosions, of a hidden likeness. The discoverer or the artist presents in them two aspects of nature and fuses them into one. This is the act of creation, in which an original thought is born, and it is the same act in original science and original art. •Learning is computational. Even infants and toddlers possess innate capabilities to see and hear patterns, something psychologists doubted decades ago. Reinforcing those capabilities by teaching patterns early might sharpen kids' brains. •Learning is social. People, even infants, learn better through social cues. We "most readily learn and re-enact an event when it is produced by a person," Meltzoff and colleagues write. "Social factors also play a role in life-long learning — new social technologies (for example, text messaging, Facebook, and Twitter) tap humans' drive for social communication," they add. •Learning is driven by brain circuitry. Brain cells fired up during both perception and action overlap in people, which allows students to identify with their teachers and speeds learning. "The young learn best from people in human social interaction. But one of the fundamental characteristics of the human mind is our flexibility and our inventiveness — our capacity to invent tools to amplify our own sensory and motor abilities," Meltzoff says by e-mail. So, the researchers say, the goal for education in this century is to create teaching tools — such as robots, computer programs or science fairs — that produce the same benefits of the very best teaching situation, one-to-one tutoring. The most interesting and alarming thing in the article is the sentence, "Learning is computational". The meaning of the word computational is as follows: (Adj. )- of or involving computation or computers; as in "computational linguistics". While the second part of the point involving pattern recognition is true, the insertion of that word computational, particularly for the casual or less informed reader implies that computers are a necessary part of education, even though they are only a creation of the last four decades of technology, and as though education and learning didn't exist before their invention. Have we become insane? How has such nonsense become so widely accepted? Someday, however, perhaps researchers will notice that if you engage children's hands, their curiosity will be unleashed. Contrived systems of robotics and computer programs that insist that children merely mimic the creativity already built into the machine are not the answers to the challenges of American education. The real, unstated purpose of the New "Science of learning" is to cut costs, by substituting new technologies for the proven, widely acknowledged need for social engagement. Surely we can outsource teaching in the same manner through which we have outsourced tech support, don't you think? That way, a very small group of American investors can make big money, hand over fist, while our children become mindless consumers, helpless in the face of corporate manipulation and teachers join the unemployment lines along with all those displaced from American industry. It can be extremely difficult for those who have been awarded the accolades and laurels of higher education to come to grips with the understanding that they are not quite as smart as they could have been. Fortunately, there are those occasional intrusions of reality: The leaks that require the invitation of plumbers to their homes. The flat tire that comes even though, through fear they buy the best tires available to avoid having to contend with physical reality. The DVD that only their 8 year old child can program despite the thorough 80 page instruction manual written in 4 languages. One of the problems people have in reading technical manuals is that each and every word actually means something. You can't just jump around and pretend you've understood. Ah, the glories of the human hand. Use it you get smart. Forget it and become educated. Or do both and change the world. It won't take long for one of my readers to learn that I am a how-to writer. I am interested in my readers being able to do what I have learned through my own experience. How-to writers need to write without obfuscation. We write direct. We write in short sentences often stripped of unnecessary verbage. Why deprive the reader of what will soon be discovered for him or her self? Our task as how-to writers is to lead our readers to personal discovery and empowerment, and if we aren't very clear in what we say, our readers will be very disappointed. Besides, the truth of our presentations can be tested in our reader's own hands, so lies, inexperience and lack of clarity will come back to haunt. I've had a short burst of rejects lately from agents and publishers, wishing me luck, but seeing no large market for the Wisdom of the Hands book. I have also been reading a variety of other books and noticing the difference between how-to writing and the kind of academic speak that gives the impression of the author's intelligence, by making the reader work so hard at getting the author's point. So far, two agents have commented on my writing style. It is direct, clear, to the point, and not at all what they are used to. They don't know how to change it or improve it, and have no comparables through which to evaluate whether or not it will sell. Oh, the challenges of the how-to writer! A curse! Where is the joy of obfuscation in what we present? I have always been good at reading comprehension. I can understand things as presented, and I know that what is clearly known can be made clear to others. When I have to work hard at my reading to understand the author's point, I am left wondering, first whether he or she knows the subject and is speaking from conjecture or experience. Then I question whether my own time would be better spent actually doing something myself. When effort is spent making something, there are tangible results from the expense of energy, and in comparing apples and oranges, I'll pick the more nutritious fruit. At some point, however, I am confident that some major publisher will realize that books are not merely for entertainment, but for changing lives. 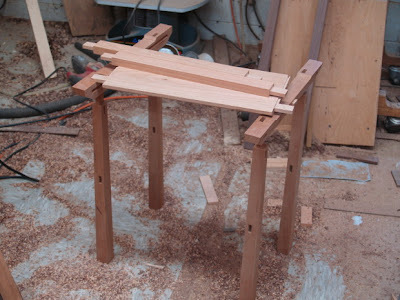 Today I've finished forming tenons on the top boards for the tables, as you can see in the photo above. It was a rather complicated process requiring the table saw, router and band saw. But the final work will be worth the effort. 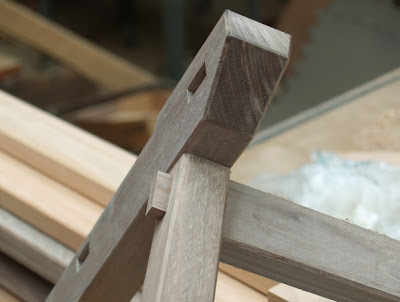 The way this joint works is that the tenon goes through the mortise and will be secured with wedges. The stub tenon running almost the full width of the board fits into the groove routed in the end piece. This allows the wide cherry board to be secured but still free to expand and contract in response to changes in humidity. One of the terms we discussed at last week's box making workshop, skosh, is one that I first heard at Marc Adam's School where I'll be teaching in a couple weeks. Skosh means a very small amount... like "take a shallow pass with that hand plane." What you would take off is just a skosh. (If you can keep from messing the whole thing up.) I was surprised to learn that the word has Japanese origins from the mid 20th Century. Sukoshi. Another word with foreign origins is pundit which means (in TV land), a person who makes comments or judgments, esp. in an authoritative manner; critic or commentator. It originated from sanscrit, Pandit or learned man. Another term for pundit is "talking head," which comes from only being able to see them from the neck up. Unfortunately, it seems an apt terminology as many of them gained their positions through the frequency and volume of their expostulations, rather than through the demonstration of wisdom in real life. It is one more example of our failure in the education of the hands.... It has become acceptable and even desirable to accept positions of authority without actually having any. A friend, Elliot Washor who became co-founder of the Met School in Providence, RI had been to a school conference concerning his son. The administrator and staff were aligned like talking heads, telling him all the things wrong with his son and his performance is school. Elliot asked, "Do any of you know he is a protégé jazz guitarist who practices three hours a night?" The idiocy, it seems wasn't on the part of the son, but in the school where staff took no interest in knowing the whole child, his son. Let's put the hands and real experience, and real passion back in schools and save ourselves from the epidemic of idiotic punditry that has shoved our nation a skosh from the brink. The most offensive pundit of late does a great job of illustrating the process of marginalizing of the wisdom of hands in the growth of our nation. In his attempt to marginalize Supreme Court nominee Sonia Sotomayor, Pat Buchanan emphasized that all of the signers of the Declaration of Independence and Constitution were "white." But, conveniently overlooked by Buchanan, the builders of the nation's Capitol and the White house were black slaves. Their forced labor is a contribution that could only be overlooked by a talking head, senseless from the neck down. His remarks could only have been made by one having far too little sense of the dignity, wisdom and significance of human labor. We should fire all the pundits and demand that they compete for real jobs in the depressed economy they have worked so hard to create. As a craftsman I can truthfully inform you that there is joy in accomplishment. 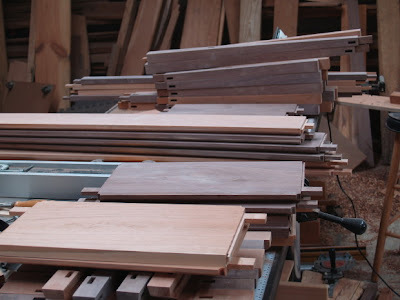 Today I am working on tables in cherry and walnut, picking up where I left off before my trip to Colorado. When you are working in real materials, they remember exactly where you left off. No need of notes or instructions as to what comes next. Click on the image above left to make it large enough to read. We know that kids in the classroom will seek creative outlets as a means to find relief from oppression. Hence the making of spitwads. I've made a few myself. In earlier days, when desks were equipped with inkwells, a quickly dipped pigtail was another effort to regain one's sense of control under depressing circumstances. Kids are just not to be trusted are they? Some time ago, I rode a passenger jet into our local airport (XNA) and my nearest neighbor Lynn was a trainer for Ken Blanchard Companies of One Minute Manager fame. We talked about the hands... and strategies to keep students engaged in learning. Can you see how the making of spitwads, might actually have benefits in the classroom? Would it be better to have students creatively engaged as an alternative to numbed on ritalin, emotionally disengaged and senseless? A strategy Lynn and other Ken Blanchard trainers use is to have manipulative objects on the conference table. Playdough, pipe cleaners and other objects, when manipulated have the power to creatively engage the mind at conference time. So is it better to have minds present at the table? Now, my query... if top corporate trainers understand the ways hands bring creative engagement of their students, why are American educators stuck in the dark ages? Perhaps we are expecting the wrong things from our students... compliance and conformity rather than creativity and engagement. 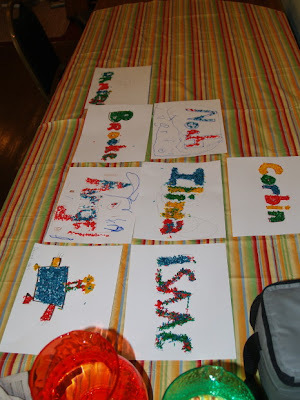 My blog post, Wandering Mind, Crafts and Creativity has been republished in the ESSA blog site which is a great way to stay current on the activities of our Eureka Springs School of the Arts. We still have openings in wonderful classes this summer. Just in case anyone wonders about the source for human intelligence, I took a few photos this morning to visually portray the origins of our conceptual framework. At this point, I've done little but provide captions, but in the exploration of your own hands, you can help me fill in the blanks. Cut. The foundation of analysis. Dividing, sorting one thing from another. this from that. Assemble. The process through which two or more things are joined either physically or intellectually as in interrelated concepts. Integration, the blending of concepts illustrating interrelationship. Order and sequence. For a woodworker, order of operations. This is similar to counting, but relates to things to be done rather than the number of objects. Counting. The origin of numbers. Is it any surprise that we have 10 fingers and a base 10 numerical system? In case anyone has doubts about the role of the hands in creating our framework for intellectual understanding, I suggest that you examine your own hands. What happens when our hands are left out of the process of education? Disengagement, discouragement, disruption and alienation. I was watching a bit of CNN this morning and they interviewed former NBA basketball player Mike Glenn. He has a basketball camp for deaf kids each summer... a thing he started 30 years ago in honor of his father. 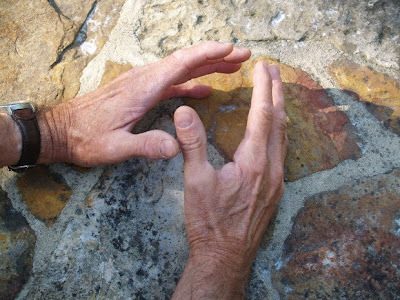 Glenn, though hearing, learned American sign language while hanging out as his father coached children at the Georgia School for the Deaf. 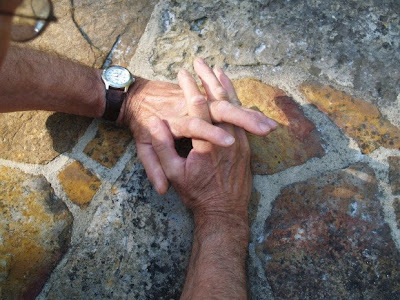 It is a moving story which I won't try to tell myself, except to note that the hands have the capacity to take the place of other forms of both sensing and expression. Blind and deaf Helen Keller met Mark Twain in his later years. He would read to her, her hand cradling his jaw from cheekbone to adam's apple, allowing her fingers to sense the vibrations of his voice, thus giving her the capacity to "listen" to his words. Those of us with all our senses take the wonders of our hands for granted. The interviewer on CNN noted that even when talking with hearing individuals, Mike Glenn's hands were in motion, gesturing the meaning of his words. On a similar subject, my wife reports that parents and toddlers coming to her Wednesday morning music sessions (now in their 29th year) at our Carnegie Public Library are communicating with sign language. The baby sign movement seems to have taken off even in our small town of Eureka Springs, Arkansas. have had little status after kindergarten." Now kindergarten is being undermined by the unreasonable emphasis placed on early reading. It as though all the wisdom of hundreds of years of pedagogy have been discarded in favor of technology and testing. Today was day 5 of my ESSA box making class and you can see the results. Miters that fit. Box joints that fit tight. Lift lids and hinged lids, interesting pulls and feet. 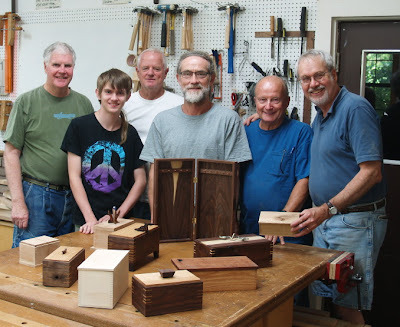 Plus some very happy box makers who have learned a lot and have work to show for it. 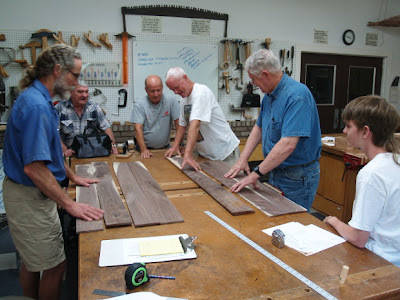 Left to right are Bill, Tillian, Pete, Les, Bill, and their teacher. Tillian is almost finished with his box, and Les has finished his first. Both show creativity. In a final day of box making, most of the students will make one more. I am enjoying my first reading of Shop Class as Soul Craft, finding many important ideas well expressed. It has been an exciting day in the woodshop. My students now have boxes ready to apply hinges. 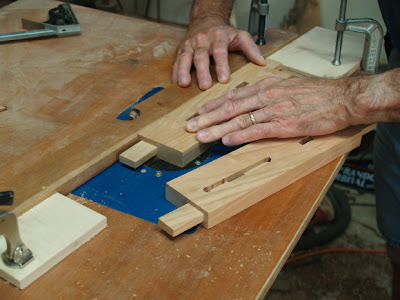 As shown in the photo above, Pete cut miter key slots in the sides of his box to give greater strength and lasting integrity to the corner joints. Learning new things is natural to humanity. Human beings strive for learning opportunities. So why is it that we fail to engage our children in schools? Could it be something in the way we teach? We look for outcomes satisfactory to the teachers, parents, administrators and even tax payers but forget that the most important outcomes are the feelings of tangible accomplishment that students feel in response to their efforts. After a time, they learn that effort is disassociated with the kinds of feelings they most crave. In schools, we create artificial learning environments for our children that they know to be contrived and undeserving of their full attention and engagement... Without the opportunity to learn through the hands, the world remains abstract, and distant, and the passions for learning will not be engaged. Today was the second day of my box making class at the Eureka Springs School of the arts. 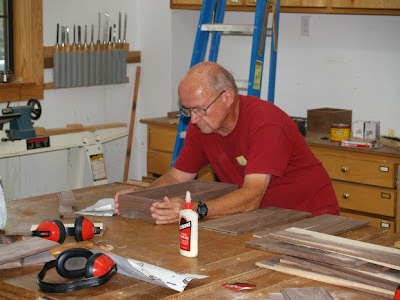 In the photos above and below, you can see Bill studying the assembly of his box, while Tillian makes grooves on the edges of his top panel to fit the sides. Bob assists with safety on the table saw. Last year, I was at a conference with Stuart Rosenthal director of Regional Technology Strategies and we discussed the approach through which to enlist corporate support for crafts education. There are obvious mental health benefits from being engaged in creative "diversions," but Stuart suggested that those mental health effects are not a compelling enough rationale, from the corporate perspective. Corporations and human resource professionals want to know how crafts education will more directly affect corporate success. The bottom line. But how do we see success at the bottom line when our gaze is fixed too firmly upon it? When Arkansas architect, E. Fay Jones was interviewing contractors for building the world renown Thorncrown Chapel, here in Eureka Springs, one of the questions he asked was, "What kind of nail gun do you use?" Of course, every contractor will tell you that Senco is the best, most reliable, and that their efficiency is based on it. But Jones hired the contractor who said, "I use a hammer." Is there an important lesson we can draw from that? Jones was looking for something more. His question was not just about nail guns, but concerned how the contractor thought... whether he or she went with the flow, consistent with what might be expected from others, or whether he or she was able to step beyond the box that restrains our thoughts firmly and depressingly to the mundane and predictable. Another good interview question is, "Do you fix your own car?" The answer has very little to do with auto mechanics, but it does tell about confidence, problem solving, and intellectual curiosity. Can you imagine hiring someone whose knowledge of the world extends only to what they have seen on-line or on television, or consists only of what they learned in the classroom? Of course not. The curiosity and confidence that it takes to fix one's own car is an expression of engagement in things far beyond popular culture and illustrates a willing committment to real problem solving. Thinking outside the box requires that "outside the box" become a place frequented and well known. Engagement in crafts offers that. When a man or woman dips regularly at the well of creativity, direct problem solving becomes a primary attribute of personality. Creative problem solving requires a wide range of diverse real world experiences. 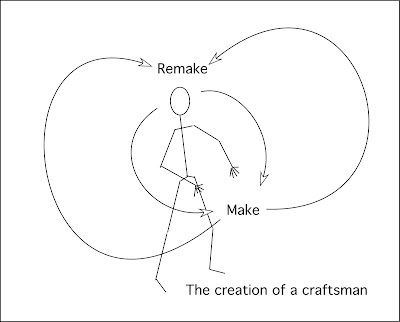 It is actually a no-brainer, the understanding that we artists and craftspeople have in our bones that our concrete engagement in making real things, expands our relationship to the unconscious mind, gaining for us, access to thoughts and creativity denied through a more direct approach. I am attempting to create a graphic representation to explain this, but in the meantime, readers might be interested in Seymour Cray, founder and director of Cray Computers, once the maker of the most powerful super computers in the world. We make discoveries, understandably, when we are at the edge, when we have taken that first step outside the box. While I can't say whether or not Cray fixed his own car, or used a hammer in preference to a nail gun, he was regularly engaged in digging a tunnel from his basement to a nearby forest. Some would have considered such a thing to be an indication of insanity, but for Cray, it was the opportunity to do his most creative work. When the conscious mind is brought to clear focus on unrelated objectives through the use of the hands, the unconscious mind is energized, bringing forth solutions to the challenges with which it had wrestled in vain. It is why they call what happens, "a brain storm," or a"stroke of genius." 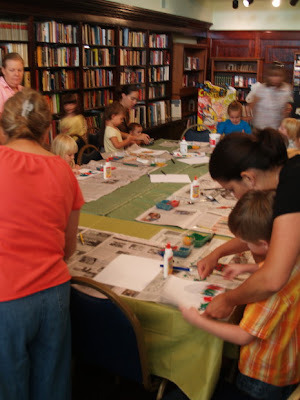 Providing the means and encouragement of employees to engage in crafts is an important means of professional development, and I hope that by discussing it, we at the Eureka Springs School of the Arts will be able to develop a strategy for engaging area corporations in support for arts and crafts education. It is one important way through which they can invest in their own success. Today we did a lot of talk about design and the origins of creativity and the narrative aspects of box making. Then I demonstrated making two kinds of sled and 4 kinds of boxes. Finally, we prepared stock for my student's first set of boxes. 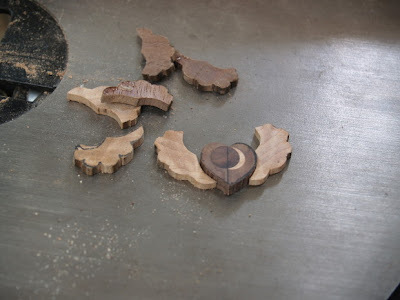 The book matched walnut will be used to make boxes with a four corner match, so each piece requires some arrangement and study as shown in the photo above. I was too busy teaching to get photos taken except this one at the last minute. There are so many things to learn about box making. One important first step involves safety. These push blocks are being made for use on the table saw to safely push stock through the cut without getting the hands too close to danger. Next they get routed with a roundover bit on the top side so they will be comfortable to grip. These are shop made devices so that I am never hesitant to wear them out, and I make a number of them at a time as they do wear out after making a number of cuts at various table saw settings and depths of cut. 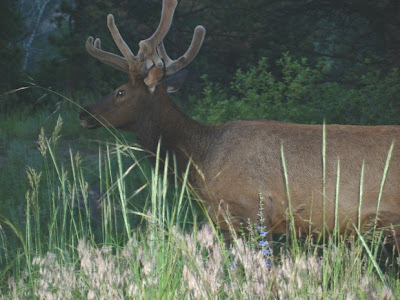 We got back from Colorado yesterday afternoon, so today I will begin getting ready for my box making class with the Eureka Springs School of the Arts. I will have 6 or 7 adult box makers with varying levels of skill and experience for 5 days of box making fun. I'll begin sharing photos tomorrow. In the meantime, I have been involved in several discussions over the last few days concerning the question, "What is happening to our boys?" That this is a widely shared concern for others is reflected in the number of books coming out on the subject. Boys Adrift: the Five Factors Driving the Growing Epidemic of Unmotivated Boys and Underachieving Young Men, by Leonard Sax is an excellent example. I personally feel, as you already know, that involvement with the hands in doing real things is an important part of the process of maturing as sound, reasonable and responsible full fledged adults. 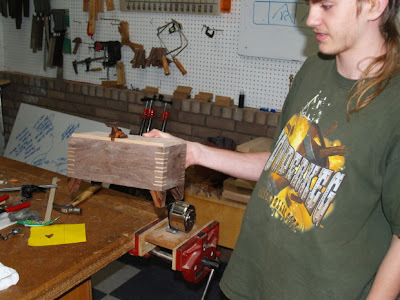 Woodworking is one of the great ways to get kids involved in learning through their hands. There are others, too. Gardening, doing chores, cooking, caring for animals, hiking in the woods, and the list goes on. There are a couple things we know don't work: Computer games and television. It is better to play music than to listen to it, and unless I am completely mistaken, there isn't a soul in heaven who got there by texting. 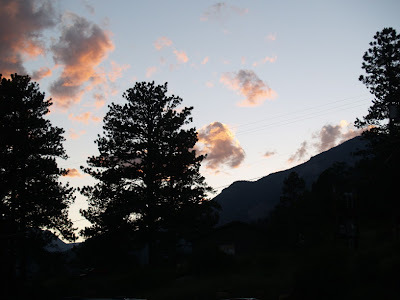 I have a last parting photo from Colorado, taken on the evening before we left. It reminds me that I need to take greater effort to be outdoors in Arkansas letting myself be more consistently reminded of the beauty that surrounds us. We are heading home from our family reunion in Colorado just in time for the 35th anniversary of the founding of Clear Spring School and for me to prepare for my box making class at ESSA which I will share with my readers next week. 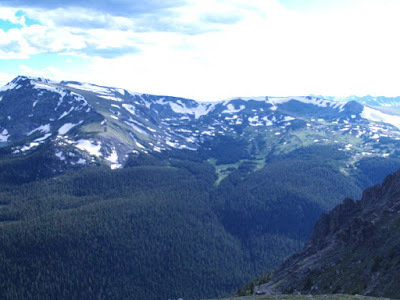 Colorado is beautiful as you can see from the photo above, and somewhat wild as you can see from the photo below. More Wisdom of the feet? And something for the eyes as well. 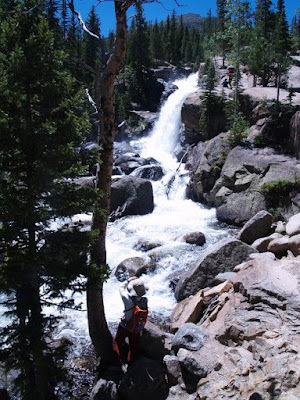 This is Alberta Falls taken this morning at Rocky Mountain National Park. 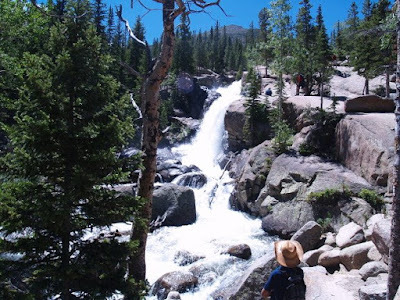 It was wonderful to see so many young families making the hike to the falls. 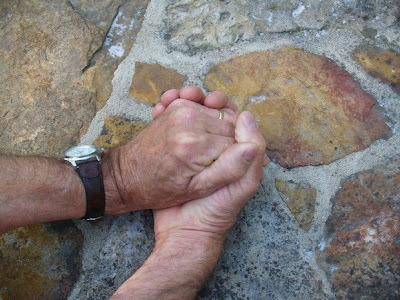 Former US Poet Laureate Stanley Kunich was in part the inspiration for the title of this blog as he wrote about the Wisdom of the Body. 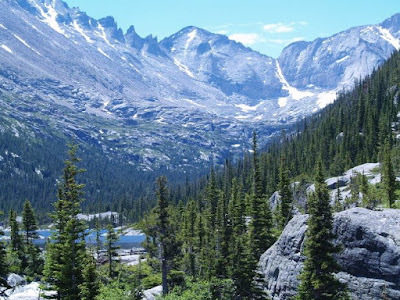 A 7 1/2 mile hike in the Rocky Mountain National Park will tell you a lot about the "Wisdom of the feet". The photo above is from yesterday's hike and today my feet are in recovery. Of course the hands and brain are only two parts of the system through which we explore the universe and come to terms with its characteristics. The trail was nicely packed with other adventurers but there were about 20-25 of us from the Stowe family reunion sharing the trail. A good walk stimulates great conversations, and serves as one more example of the integration of mind and body that facilitates exploration of consciousness and deepening of relationship. "The hand is the cutting edge of the mind." Today, you will need to get out your scrollsaw, and if you have prepared your stock as suggested, make your cuts. If you are lucky you will end up with multiple parts, perhaps two hearts and 4 wings. The next steps will require sanding. 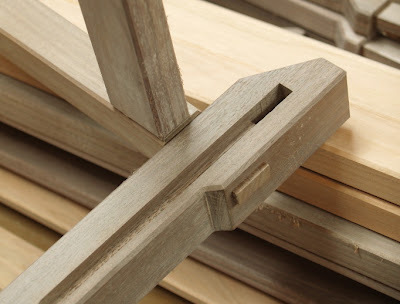 I use woooden dowels and thin pieces of wood wrapped with sand paper to make sanding blocks. To know what we're making you will have to review earlier posts. My wife and I are currently driving across Kansas and I am remembering the question, which is flatter, Kansas or a pancake. The research indicated that Kansas was actually flatter, but there are actually many hills when traveling across the state. Take a piece of maple stock and make a series of cuts, each with a 1/8 inch kerfed blade. 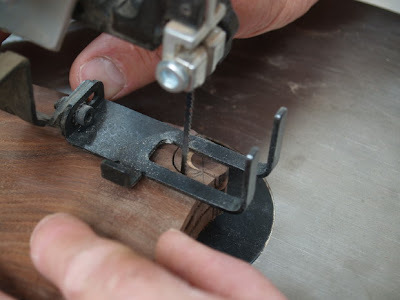 You will only need to cut in a few inches, then pull the stock back from the cut, turn the saw off and adjust the fence for the next cut, and repeat until you have a series of uniform cuts. 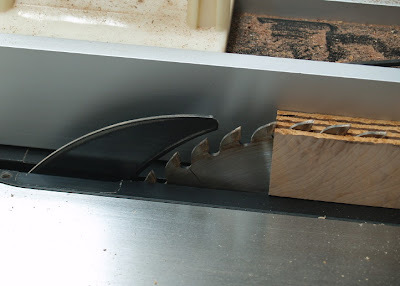 Then insert 1/8 inch thick spacers into the saw kerfs as shown in the photo below. I use some hot melt glue to hold the spacers in place so they don't shift. 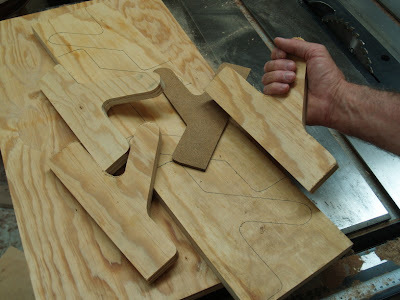 The tools you will need tomorrow are a scroll saw. You can see the crescent moon inlay complete. 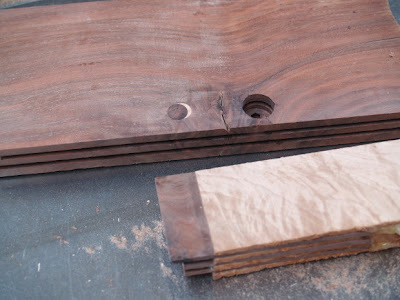 You can also see your next step shown on the edge of the walnut stock. Make saw kerfs into the edge defining the thickness of the heart. Now you can be creative. I cut out a paper heart and then sketched wings on the maple stock. You can do something different if you like and then share it with other readers. work along with me here.